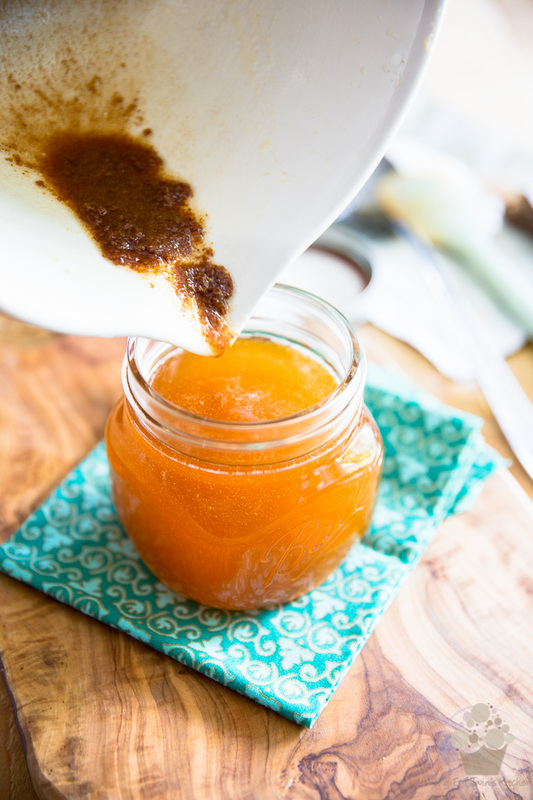 Making brown butter really isn’t complicated as it may seem. 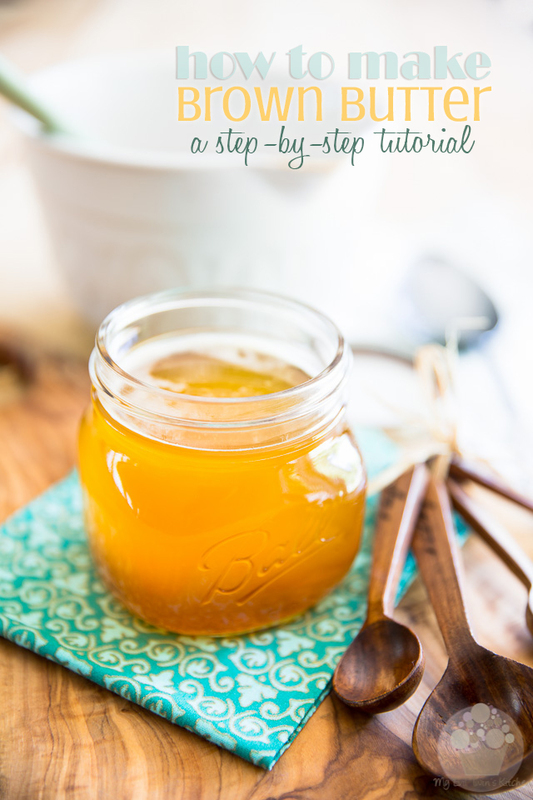 Learn how to make your own in this easy to follow step-by-step tutorial. 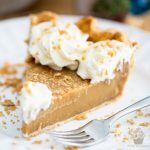 Ever since I’ve learned how to make it, and how easy it actually is to make, Brown Butter is something that I keep in my kitchen AT ALL TIMES! 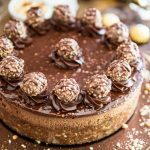 As you probably know, it’s extremely popular in the baking world, but did you know that it can be used for so much more than “just” baking? 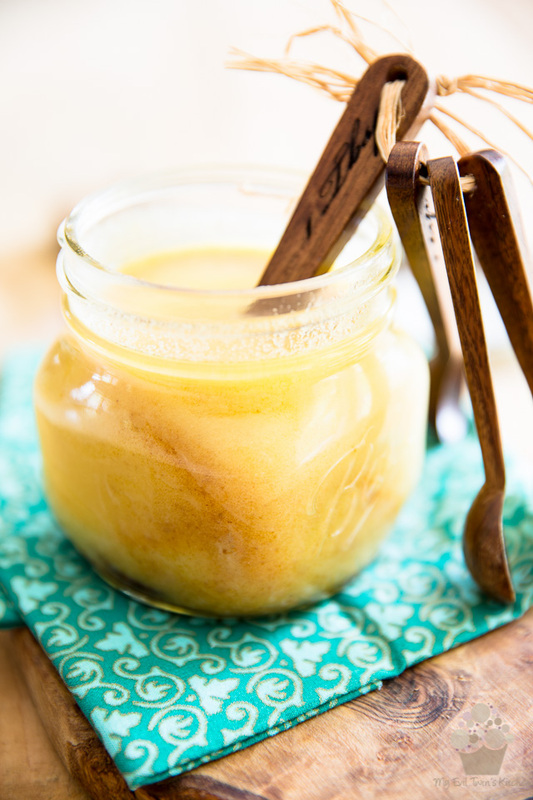 In fact, in many cultures, brown butter is considered to be an actual flavoring, a condiment that is used to enhance the flavor of other foods. 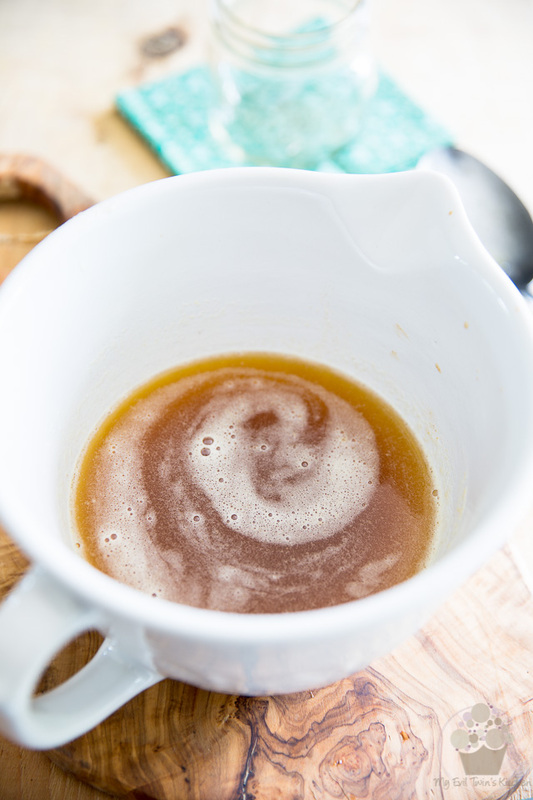 This heavenly aroma enhancer is created by simply melting butter and cooking it long enough for the milk solids to separate from the fat, sink to the bottom of the pan and caramelize. As they do that, they turn brown in color and confer a rich, complex and nutty fragrance to the butter, with very subtle undertones of caramel. In short, this means that you can use brown butter to cook or bake basically everything and anything; yes, even savory dishes. It will make whatever food it comes in contact with taste better. You can practically use it anytime butter is called for, in the exact same way you would use said butter, in a one to one ratio. And you can also use it in a melted state to replace oil in most recipes. 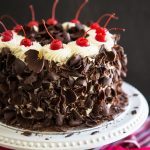 Some people will argue, however, that it would be a bit of a waste to use brown butter in baked goods and dishes that use very powerful and dominantly fragrant ingredients, such as carrot cake,chocolate cake or brownies, for instance. I personally beg to differ. I find that, even if its flavor isn’t really discernible, brown butter will always add an extra layer of richness, a certain depth to the flavor of baked goods, a little “je-ne-sais-quoi” that you can’t quite put your finger on but keeps you coming back for more. I mean, if brown butter were really expensive of super complicated to make, I’d understand using it only parsimoniously. But seriously, it doesn’t really cost much more than butter or oil and is so easy to make that there are no reasons why you shouldn’t keep it handy at all times and use it every chance you get. 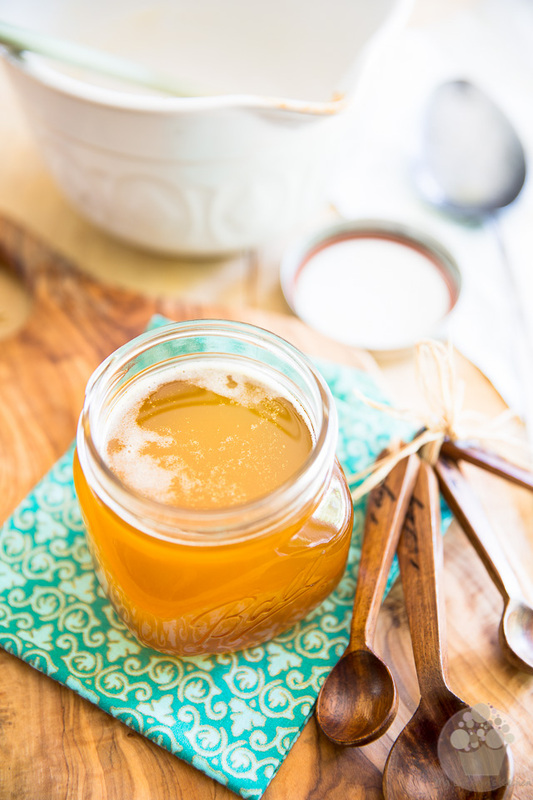 A lot of people are under the impression that brown butter should be made at the last minute because it can be tricky to keep… Opinions vary greatly as to whether brown butter should be kept at room temperature, or even made ahead of time. Personally, I think that you should store browned butter the exact same way you usually store your butter. Some people keep theirs in the pantry, some people refrigerate it. Brown butter, in my opinion, is safe to keep at room temperature, providing you follow a few simple rules. Because the milk solids get completely cooked and then get trapped under a layer of pure fat, which provides a perfectly dry, oxygen-free environment, so long as you store your brown butter in an airtight container and always use clean utensils when you grab some from the container, you should have no problem keeping it at room temperature for at least a few weeks. But, if you wanted to play it safe, you could just as well refrigerate it; you’d then be able to keep it for up to a month, perhaps even more. 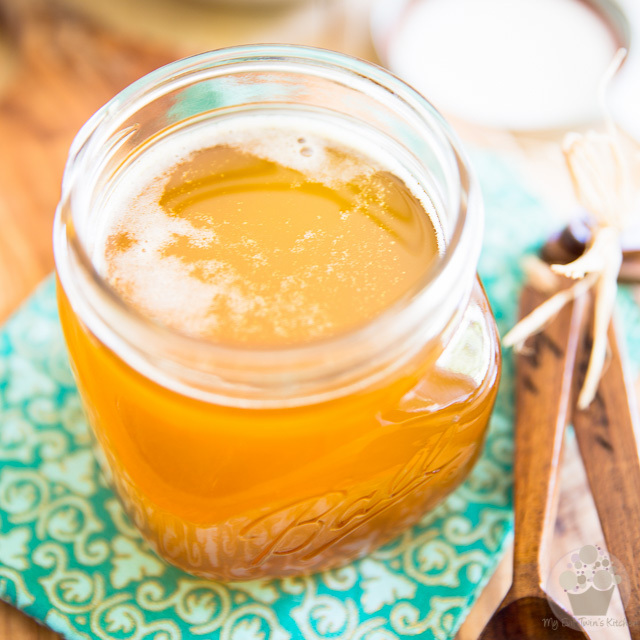 Or, you could take your brown butter one step further and turn it into ghee by simply filtering out the brown bits. 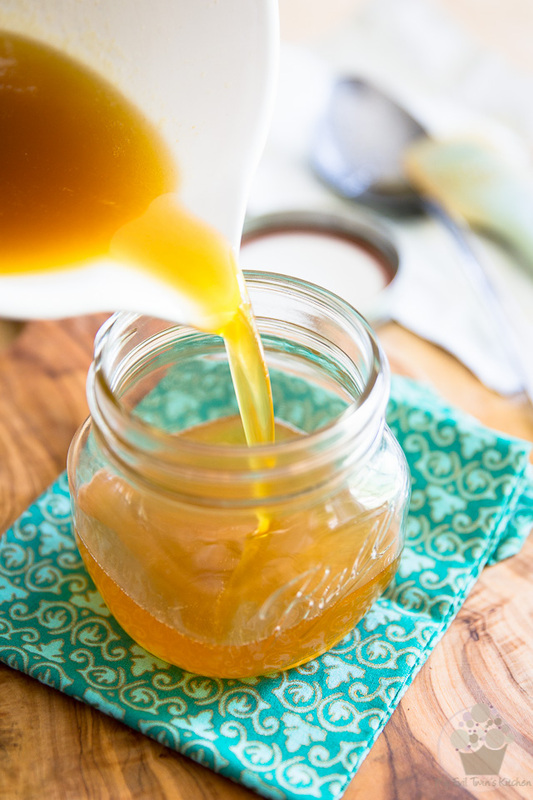 Most of the flavor from the caramelized milk solids gets infused into the fat, so ghee still has the same amazing, nutty and rich flavor profile. However, it does present the advantage of being entirely shelf stable and safe to use for those who are lactose intolerant. In summary, brown butter is super easy to make, keeps really well and makes everything it touches taste better. 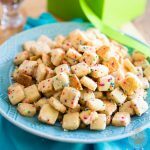 You can use it in lieu of butter or oil in practically any recipe… Once you realize just how easy it is to make, I’m ready to bet that you too, will start using brown butter all the time. To make it, I have a foolproof technique that I’ve been using for a few years now, which never once failed; not once did I end up burning my butter. Not once. All you need to do is follow a few simple instructions, keep a really close eye on your butter and I can guarantee that you will succeed. Soon, you’ll be making brown butter with your eyes closed. I find that the butter goes through 5 very distinct “visual” stages while making brown butter, so I broke down the recipe into 5 sections and wrote down approximately how long you should expect each stage to last. 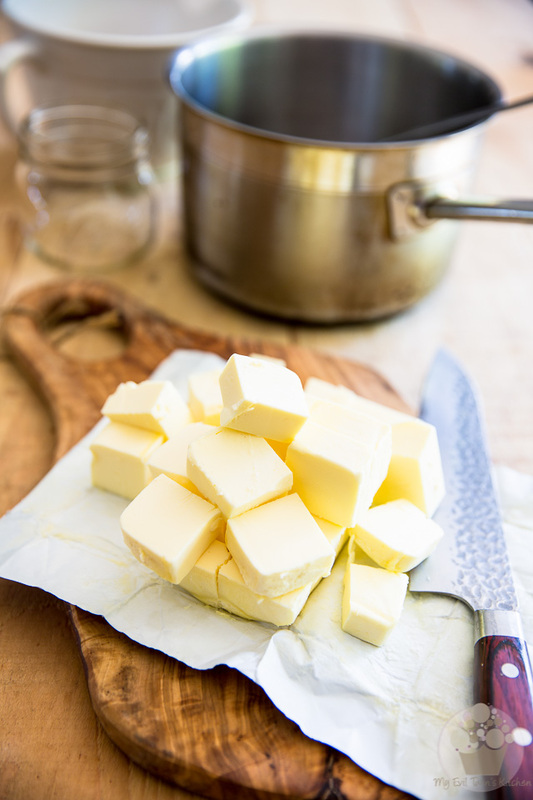 The first thing you should do is cut your butter into roughly 1-inch squares; this will help it melt faster and more evenly. Also, keep in mind that a lot of water will get evaporated during the process, so it’s VERY important that you always stick to UNSALTED butter when making brown butter. If you used salted butter, your finished product would be way too salty. Place your butter in a medium, heavy bottomed saucepan set over medium heat and stir it gently from time to time. At this point, your butter will be foamy, bright yellow and opaque. Soon after the butter is melted, a thick, white foam will start to form at the surface. Keep stirring and scraping the sides of the pan with your spoon until your butter starts to simmer and then turn the heat down to medium-low. This “popping” stage should last about 5 minutes, until the white foam completely disappears. During this stage, reduce stirring to a minimum. Simply scrape the sides to prevent burning and let the butter do its thing. When the butter starts to “pop” through the foam, you should practically stop stirring and simply let the butter simmer and watch the bright yellow bubbles emerge from that thick foam. 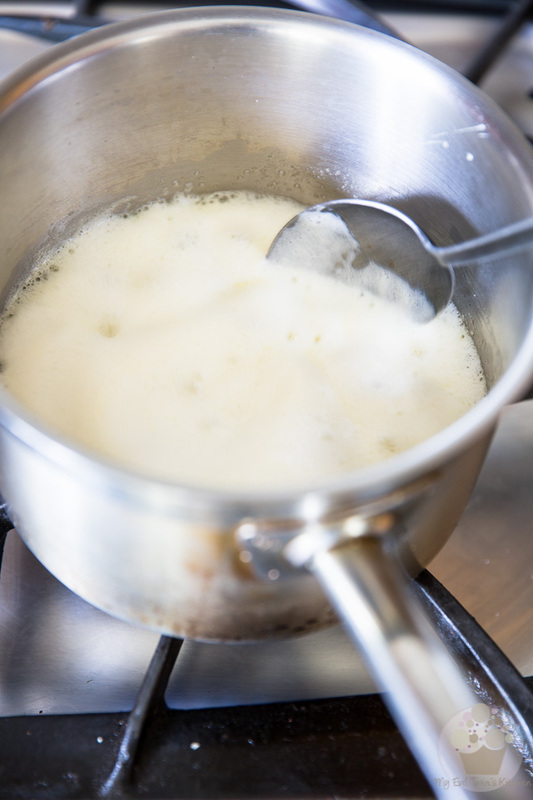 As the bubbling increases, you’ll notice that the foam will become thinner and that the bubbles will become bigger and clearer: the milk solids are starting to cook! Soon, those milk solids will start to curdle and sink to the bottom of the pan. Some will also attach to the sides of the pan. That is completely normal and desirable. 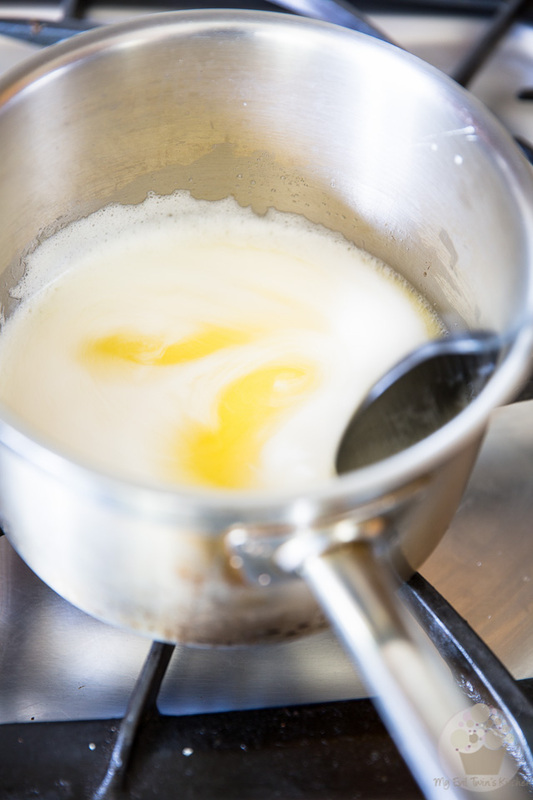 When that happens, you’ll want to give your butter a gentle stir and scrape the sides of the pan with your spoon to help those milk solids sink back to the bottom and prevent them from burning. 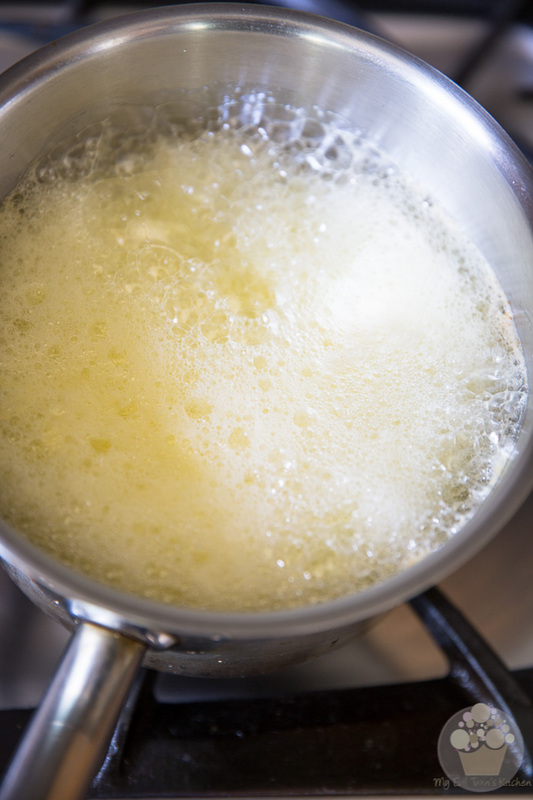 As more and more of those milk solids sink to the bottom, you will notice that your butter is beginning to clear up. This “bubbling” stage should last about 1 or 2 minutes, until the white foam comes back in force. Again, don’t be stirring too often, a gentle stir from time to time will do. You want to be monitoring those bubbles closely! Your butter will continue to get more and more translucent, the bubbles will get larger and the foam will eventually completely disappear. Your butter will start to take a nice golden coloration as the milk solids, which are now at the bottom, begin to brown. Keep a close eye on your butter and perhaps give it another gentle stir, scraping the sides and bottom, just so the milk solids don’t attach to the pan and burn. This second foaming happens fast! In a matter of seconds, that foam will start rising dangerously… Watch real closely now! We’re waiting for the butter to start foaming and raising a second time. When that happens, it’ll be the indication that our brown butter is done. 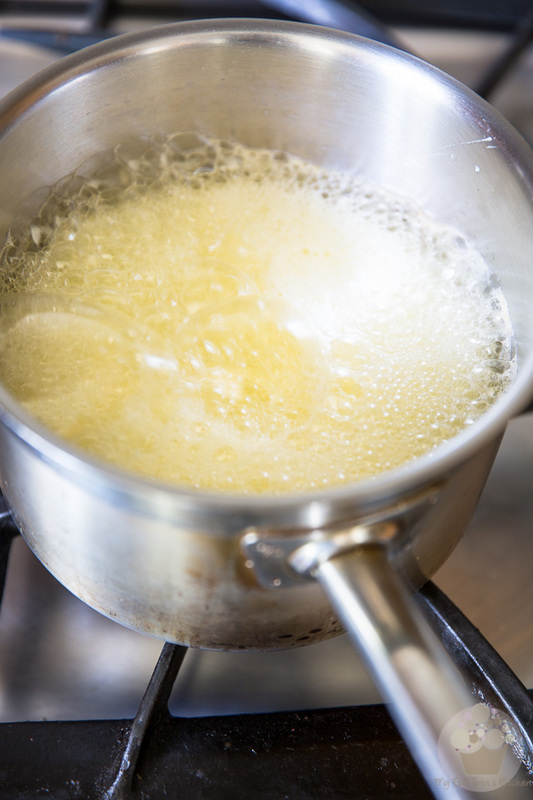 The instant your butter starts foaming for a second time, take it off the heat. See how high that foam climbed? There really is no missing that second foaming, and it happens every single time, without fail. As soon as the foam starts to rise, immediately remove the pan from the heat source and give the foam A FEW SECONDS to settle. Swirling the pan a little really seems to help with that. Don’t wait until all the foam is gone, though. 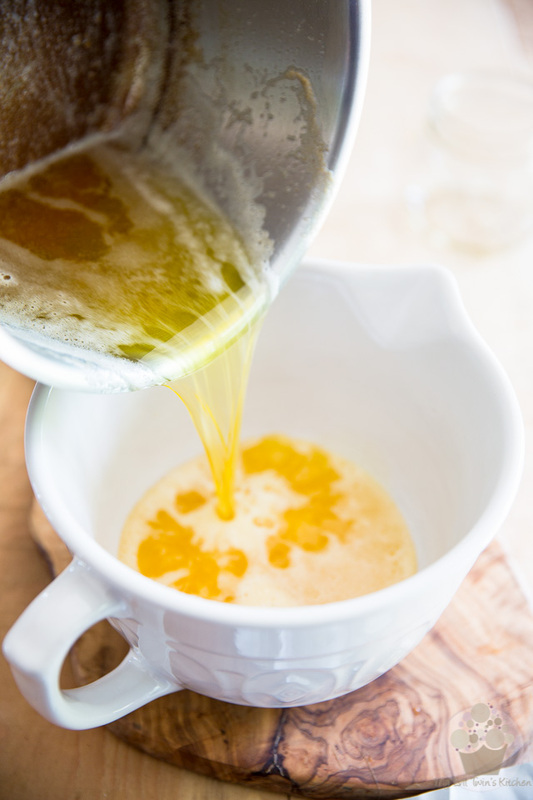 Pour your brown butter into a large bowl, preferably one that is equipped with a pouring spout. That spout will make your life easier when you transfer your brown butter to a clean jar in a few seconds. 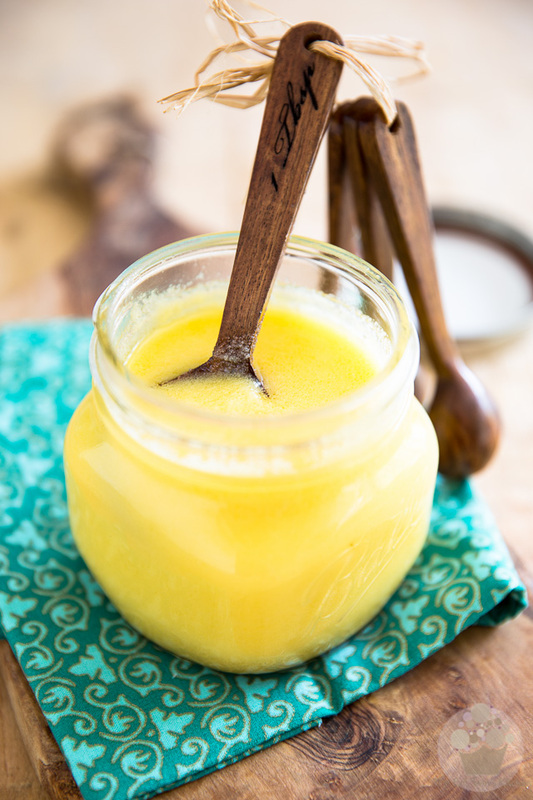 The reason why you want to transfer your butter to a bowl and THEN transfer it to a jar is to stop the cooking process. If you were to leave the browned butter in the hot pan to rest, the caramelized bits at the bottom of the pan would continue cooking and would most likely end up burning. Trust me, the extra step is very well worth taking! Don’t forget to scrape any brown bits that may have attached to the bottom of the pan; this is pure, concentrated golden flavor right there! 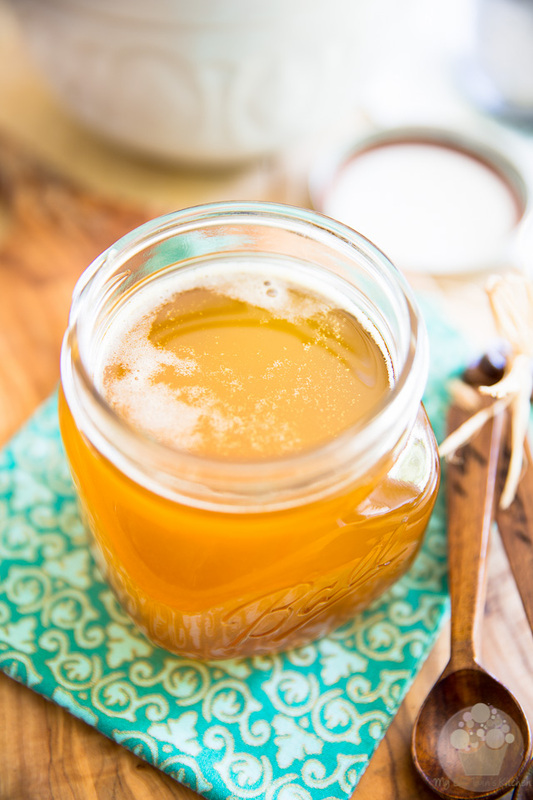 …and then transfer it to an airtight container, such as a 16oz (1 pint) Mason type glass jar. Again, don’t forget to scrape all those beautiful brown bits. You wouldn’t want to leave any of that amazing flavor behind! Otherwise, cover your jar loosely and let your brown butter set for several hours at room temperature; this generally takes a full day. Note that if it’s particularly warm out, like it currently is in my neck of the woods, it may never set completely and remain a bit on the soft side. That’s perfectly okay. Before my butter has a chance to set completely, I always like to give it a good stir so all the beautiful brown bits get mixed in with the butter, as opposed to just laying at the bottom of the jar. Once your brown butter has set, you can store and use it just like you would normal butter. Fridge or pantry… the choice is yours! 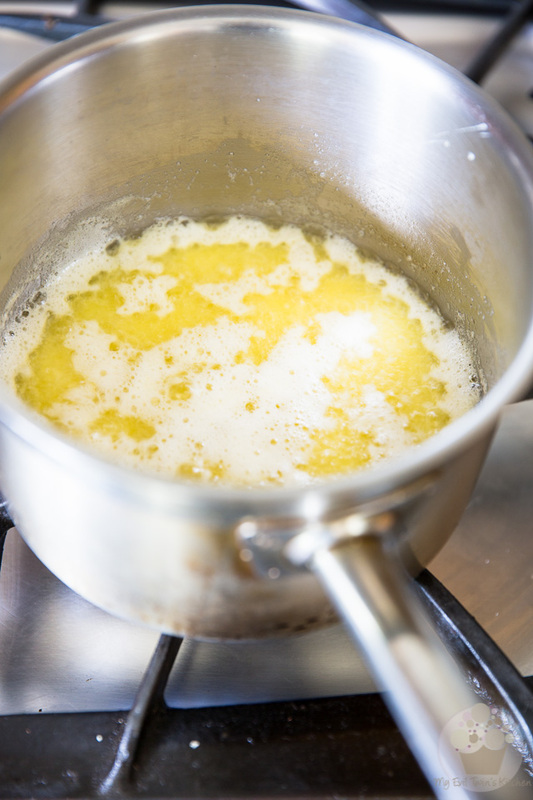 Cut your butter into roughly 1-inch squares and melt in a medium, heavy-bottomed saucepan set over medium heat, stirring gently from time to time; Soon, a thick, white foam will start to form at the surface. Keep stirring gently until your butter starts to simmer and then turn the heat down to medium-low. For the next 5 minutes or so, simply let the butter simmer, gently scraping the sides of the pan from time to time to help the milk solids sink to the bottom. As that happens, you will notice that your butter is beginning to clear up. Keep a close eye on it: the bubbles will get larger and larger and the foam will eventually completely disappear. Then, the butter will start to foam for a second time. As soon as that happens, your brown butter is ready. Remove the pan from the heat source, give the foam a few seconds to settle (it helps to swirl the pan around a little) and then pour your brown butter into a large bowl, preferably one that is equipped with a pouring spout. Don't forget to scrape any brown bits that may have attached to the bottom of the pan! 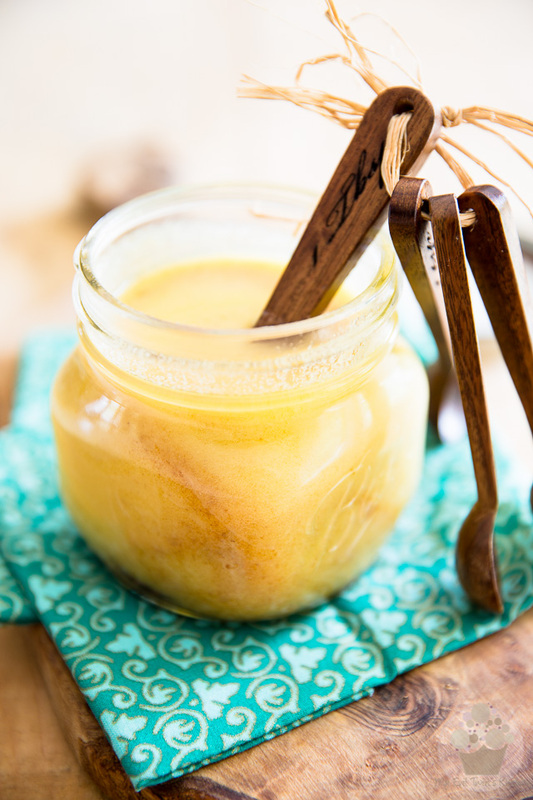 Cover your jar loosely and let your brown butter set for several hours at room temperature; this generally takes a full day. You can then store and use your brown butter just like you would normal butter. 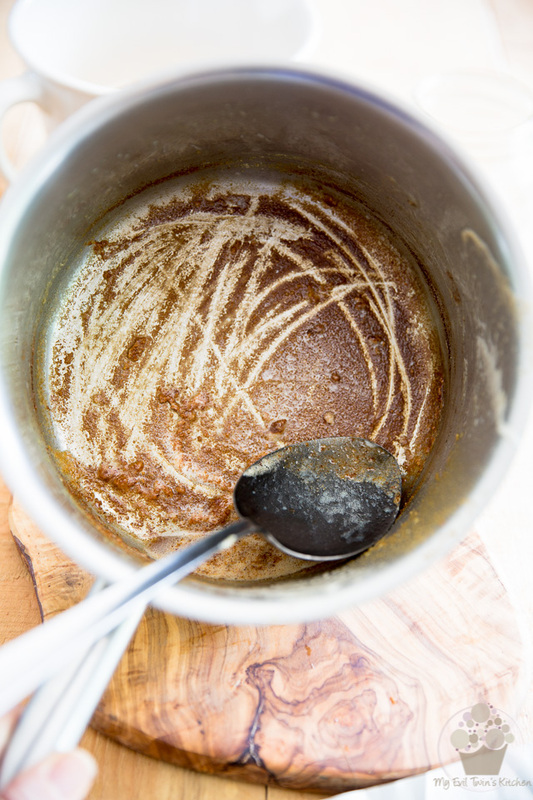 Of course, you can use your brown butter just as soon as it's ready if your recipe calls for it in a melted state.